Today I decided to get out of the hustle and bustle of the city, and I went on an excursion to a small rice farming town in near Mount Fuji. I usually travel by train, but today we went by minibus. This was only my second time out of the city via the highway system, and thus only my second time at a Japanese highway rest stop. I had a good experience at my first Japanese rest stop in April, but this rest stop bathroom was amazing. The rest stop today had the best public bathroom that I’ve ever been in! And it was great to see Lean principles of visual systems, standard work, and 5S in action. 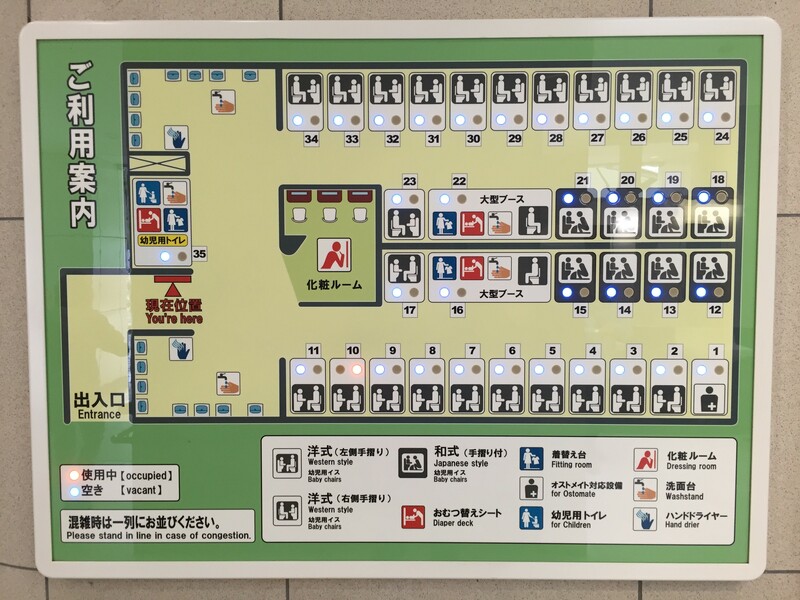 When you first walk into the bathroom, you are greeting by a large map of the restroom that lays out the entire floor plan and indicates which stalls are available (green light) or occupied (red light). 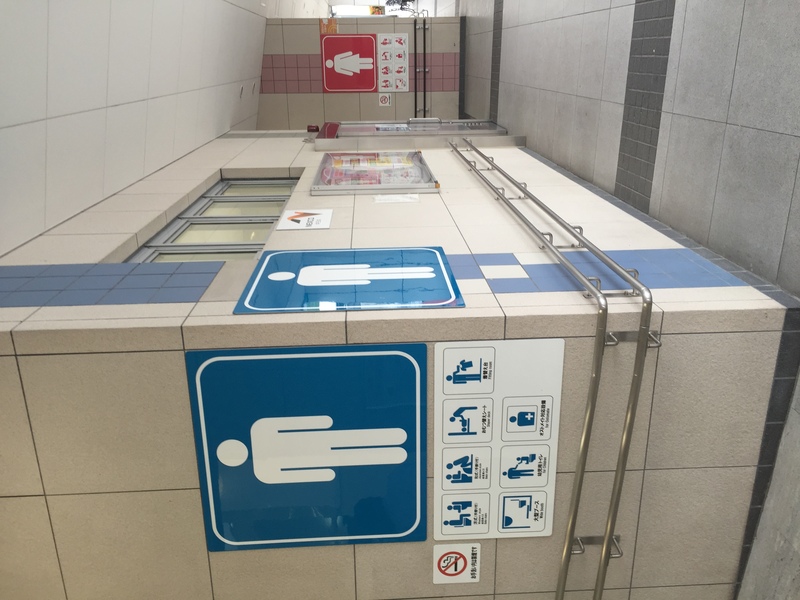 Visual map of the restroom, indicating which stalls are occupied and which are “Western” versus squat toilets. They clearly understood the spikes in customer demand that happens when multiple tour busses pull up at the same time. Ready for the tour bus to unload. 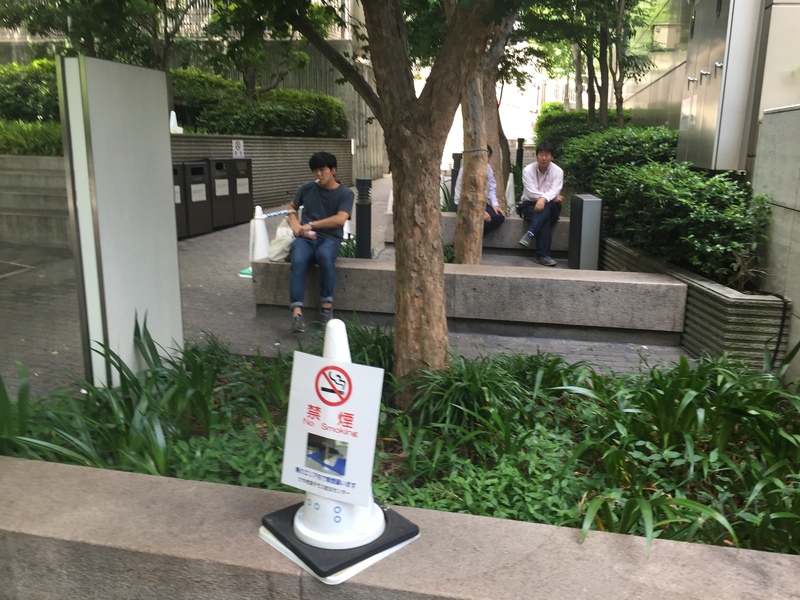 There were many stalls, including Western and squat toilets, baby changing areas, and clothes changing areas. The men’s room also had baby changing areas. 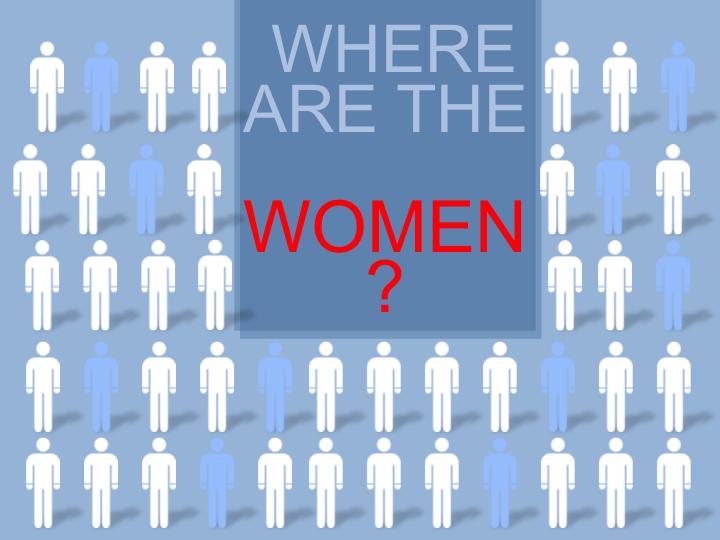 Both the men’s and women’s restrooms had stalls for baby changing and children’s toilets. The stalls were clean and spacious. 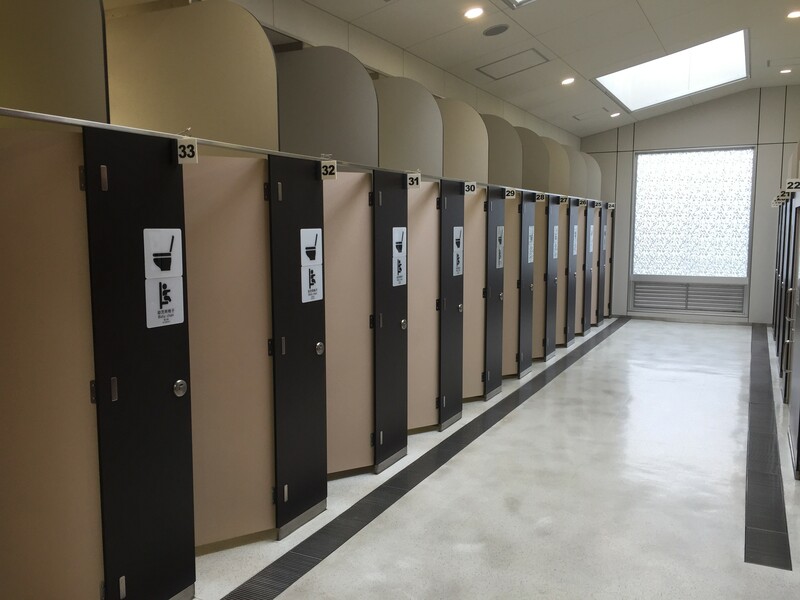 The stalls themselves were clean and spacious, with all necessary supplies available in each stall. 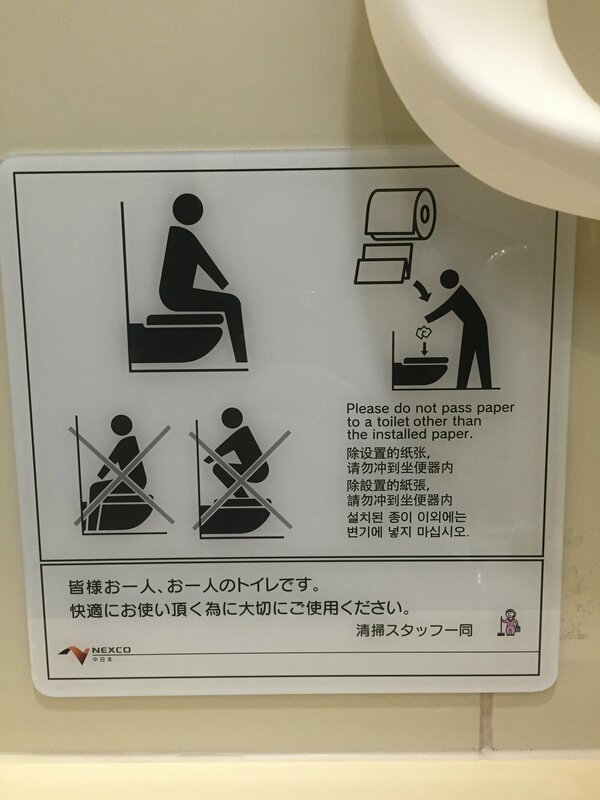 There was a place to put a cane (including instructions for use), a child toilet seat, and a child restraint (so your toddler is safe while you use the toilet). The actual stalls also had great signage and clear directions for how to use the equipment. 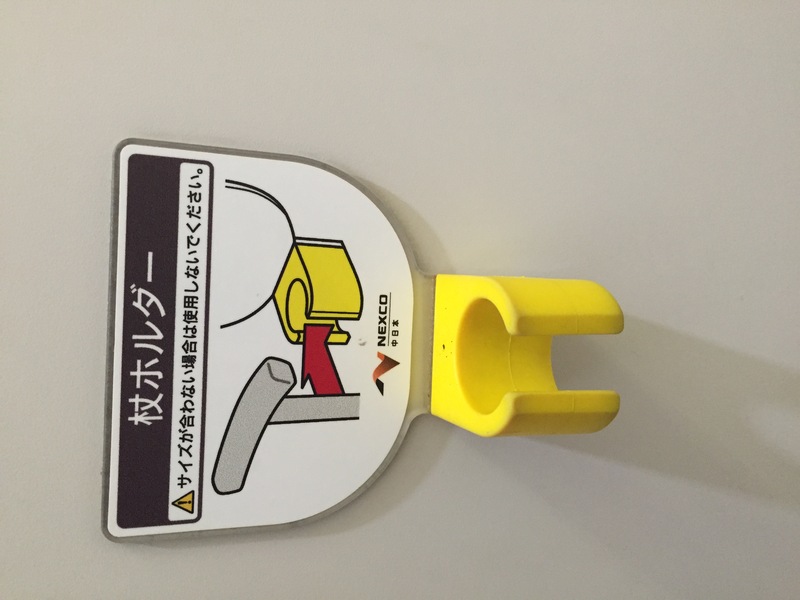 The visual instructions were simple to understand, if you if don’t read Japanese or English. A cane stand, situated egonomically by the toilet. 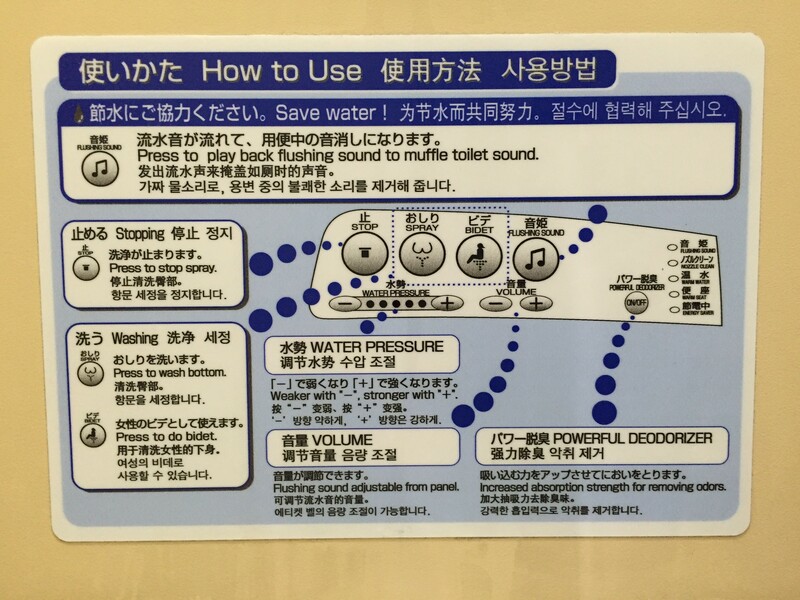 Given the complexity of many Japanese toilets, I appreciate the multiple languages and simple visuals giving instructions. Having had a few mishaps (and literally, some misfires) when I first arrived, I would have appreciated such great instructions on our toilet at the hotel and our apartment. Visual and written instructions for how to operate the many functions. 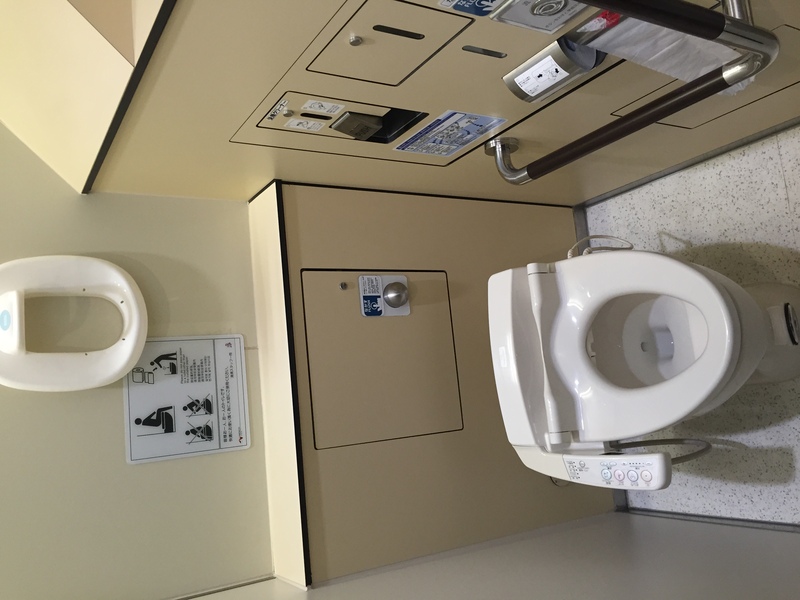 Note the common Japanese toilet features such many bidet services, as well as the “privacy” sound of fake water running so that others don’t have to listen to you. How to use a Western-style toilet. In case you are new to Western style toilets, there are instructions for use. 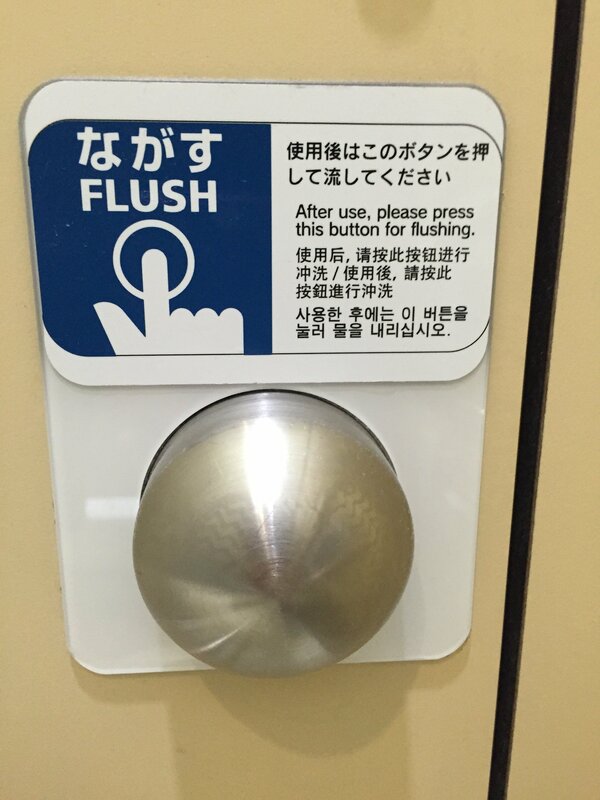 Instructions for how to flush. 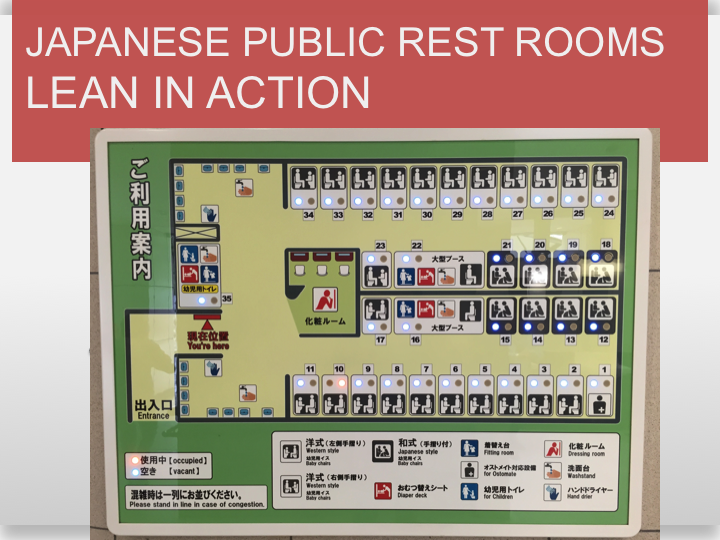 I think about my experiences at most American rest stops or public bathrooms….. We have a lot to learn from the Japanese! 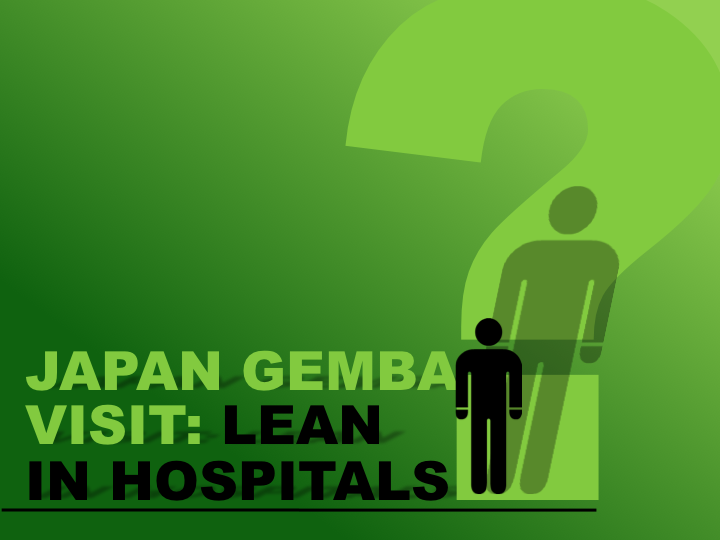 Update (June 2016): A year later, Christoph Roser wrote a similar article about his observations about Lean and Japanese public toilets. 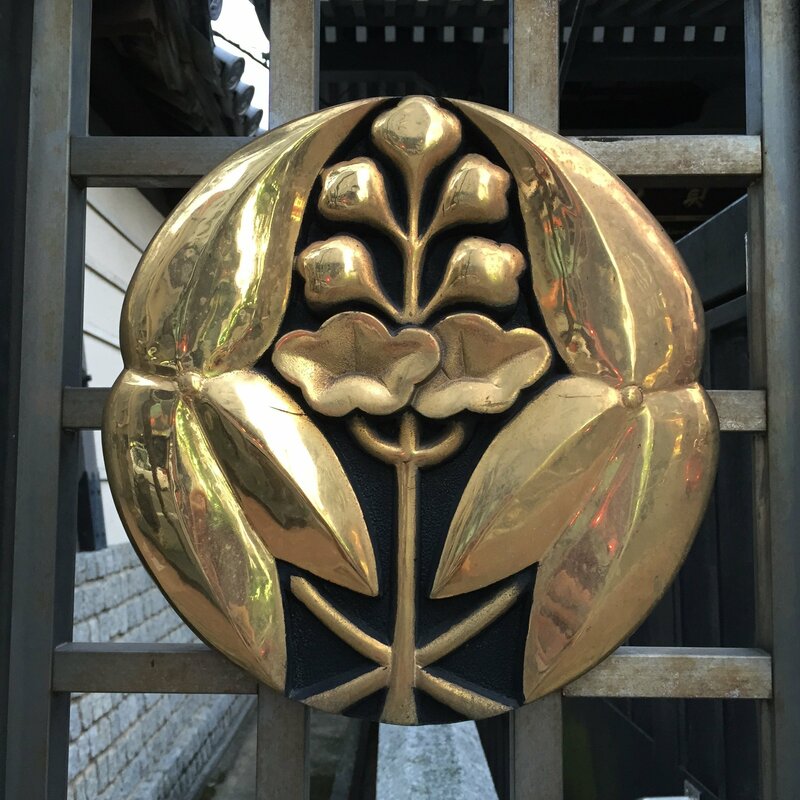 Sign up to receive notifications about new blog posts. 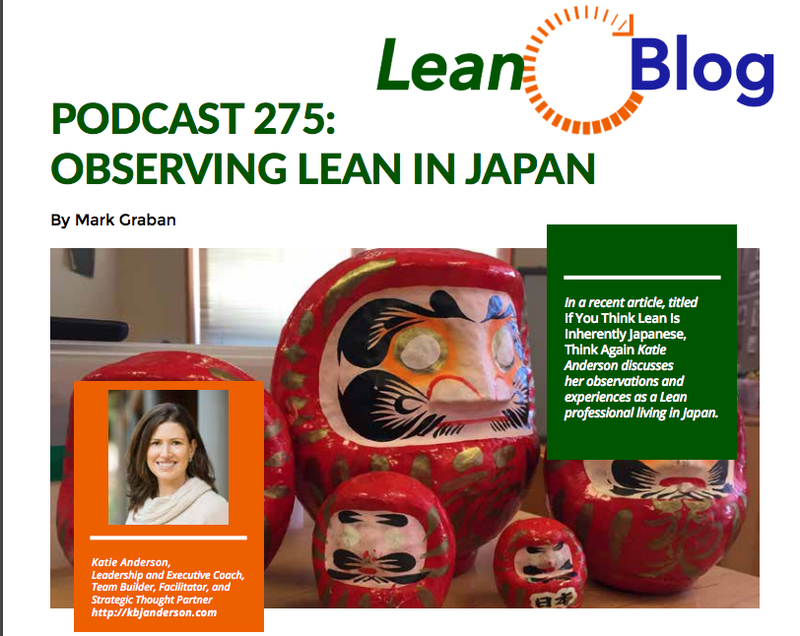 Upcoming posts include more Japan gemba visits, reflections from the Australasian Lean Summit and Healthcare Symposium, and life in Japan!